Sydney boasts an array of family-friendly attractions sure to please every member of the family. The world’s largest IMAX theatre is right there on Darling Harbour. Also on the harbour are a marine museum and the Sydney aquarium. iFly Downunder, the country’s first indoor skydiving facility, will have kids of all ages flying like Superman in no time. Of course, Sydney’s gorgeous beaches are family-friendly and offer many playgrounds and roadside fish and chip stands. There is a wide choice of family-friendly accommodation in the city. The best way to enjoy everything this vibrant city offers is to stay right here. 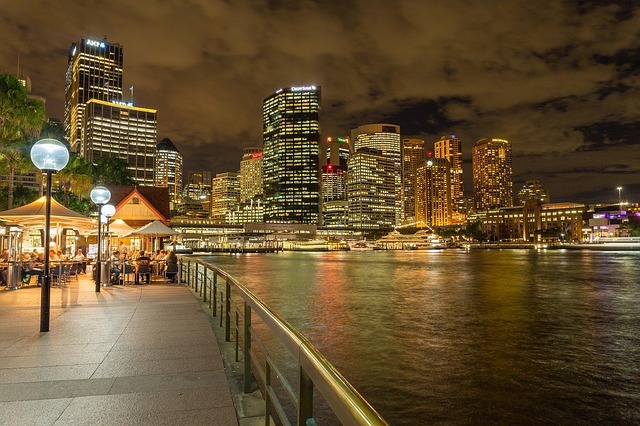 Take a walk along King Street Wharf or Pyrmont Bridge and discover the many cafes and restaurants in the area. If shopping is on your to-do list, head out to Pitt Street Mall, Chinatown or Oxford Street. Sydney is a great place to visit but, like many popular places, trying to find the best family accommodation in Sydney can cause headaches! 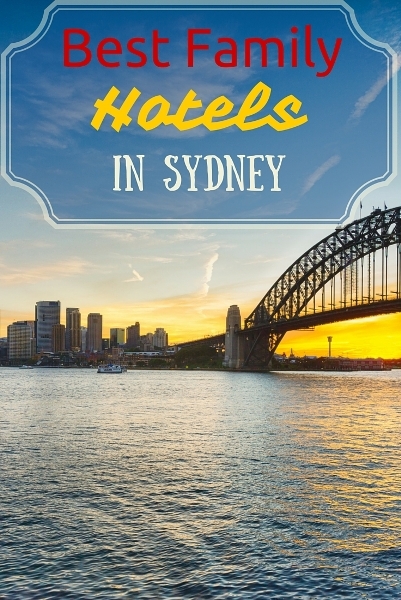 Below is our list of the 10 best family hotel options in Sydney. Hopefully, it helps make this decision easier for you. When searching for family friendly accommodation in Sydney, it is a big plus to find a hotel with spacious, top-notch apartments outfitted with a washer, dryer and kitchenette. Fraser Suites Sydney fits the bill perfectly. Sleeping up to 5 comfortably in the smoke-free 2-bedroom apartments, this 201-suite hotel offers a heated indoor pool, buffet breakfast in their restaurant, free Wi-Fi in all apartments, and a 24-hour front desk. Babysitting is offered here as well, and the little added touches like free newspaper, soundproofed rooms and daily housekeeping ensure a complete vacation for all members of the family. Considered amongst the best accommodation in Sydney, Fraser Suites Sydney is ideally located in the centre of the business district, within an easy 5 to 10-minute walk to a range of shopping venues such as the Pitt Street Mall, and the Queen Victoria Building marketplace. A 15-minute walk takes you to the Maritime Museum and the nearby wharf with its arts and cultural events. There are dining options galore in the area. These 2-bedroom apartments are very close to Darling Harbour and offer excellent value in a superb location. Though situated near many restaurants, the apartments include a kitchen where families may prepare meals. Watch the sunset over the harbour on your balcony while having a light meal, or take a break from touring the area and enjoy a swim in the indoor pool. With 24-hour check-in, indoor pool and hot tub and tour desk, these apartments provide everything necessary for family accommodation in Darling Harbour. This airport hotel is an excellent choice for easy access to early flights from the airport. Only a 3-minute walk from the airport, this hotel is extremely convenient for travel-weary families. Families of up to 4 will appreciate the family rooms, which have a queen bed and 2 single beds, making them ideal as Sydney family accommodation. Cots can be provided as well. A substantial buffet breakfast is available at the on-site restaurant. There is a fitness centre with gym, a business centre and free Wi Fi. Set in the middle of the Elizabeth Bay, Darlinghurst, and Rushcutters Bay districts, this boutique 4.5-star hotel is a perfect choice for first time visitors to the city. Larmont Hotel Sydney by Lancemore is within walking distance of the shopping and financial districts, and Bondi Beach and its beachside activities. 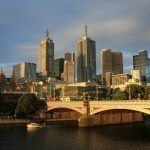 The Art Gallery of New South Wales, Sherman Contemporary Art Foundation, and St. Mary’s Cathedral are also within walking distance. Modern guestrooms and apartments offer free wifi, a fitness center and a zen spa. There are 1, 2 and 3-bedroom apartments available. 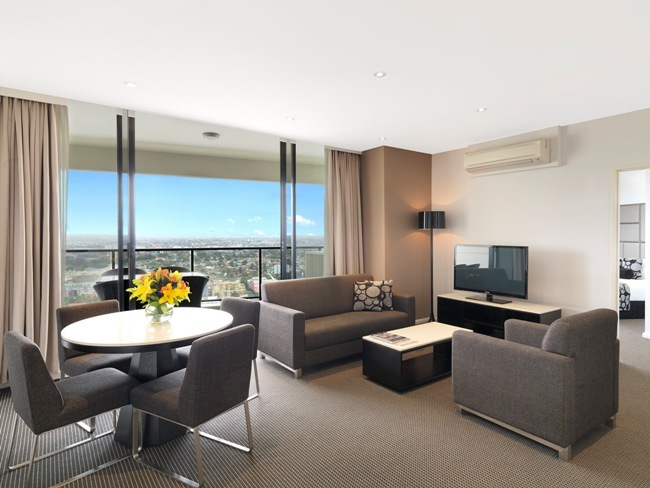 Reasonable rates and a location in the centre of all the action make the Larmont Hotel Sydney by Lancemore one of our recommendations for Sydney city accommodation. Another good choice for best accommodation in Sydney is the Rydges Sydney Central Hotel. It lives up to its name, located in the centre of Sydney and close to many major attractions. Its location in Surry Hills means that cafes, galleries, antique shops and Chinatown are all within a 5- to 10-minute walk. Bohemian designer types will appreciate this modern neighbourhood. Top-floor rooms offer views of the city. A 15 m indoor heated pool, gym and sauna offer up plenty of options for families, and deluxe King beds and sofa beds ensure activity and comfort are part of your stay. Best part: Priority rewards members get good deals including breakfast, parking and no extra charges for a sofa bed for the kids. Be aware: Prime location comes with a price and you are paying for location here in this excellent hotel. Paid parking. A boutique hotel, close to Bondi and Bronte beaches and a short walk from the Central Railway station. Rooms here include kitchenettes and the 2 and 3-bedroom apartments are completely equipped for families. The apartments can sleep up to a max of 6 and guests can choose a king or twin beds in each bedroom. 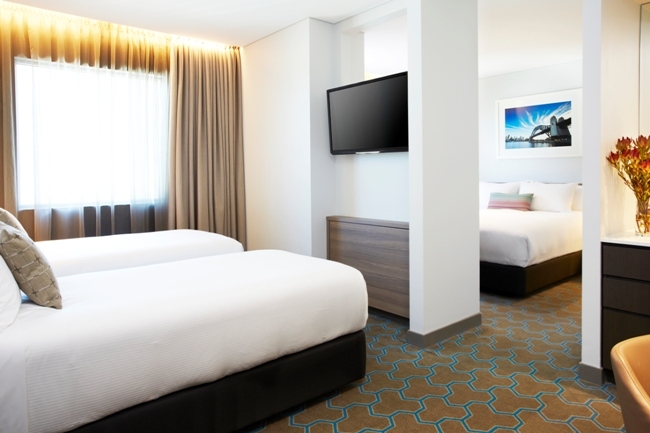 Recommended as excellent family friendly accommodations in Sydney, this hotel features laundry facilities, free WIFI, LCD TV’s and double-glazed, soundproofed windows. Room service and a breakfast room create plenty of options if you choose to not prepare your own breakfast in your room or apartment. Best For… Families with younger or older children, who need space to spread out, yet want easy access to dining options and attractions. A mere block from the beach, this stylish Sydney family friendly accommodation has a spectacular waterfront location. Guests staying at this kid friendly Sydney hotel find themselves within walking distance of Manly’s many restaurants, cafés, bars and shops, and attractions such as Manly SEA LIFE Sanctuary, Manly Kayaks, and scenic coastal walks. You will find a wide range of elegantly appointed rooms, studios and apartments with a kitchenette. Two swimming pools, a spa and a kids club allow for leisurely fun, and the Manly Wine restaurant located on-site features beachside dining. This hotel is one of our best picks for family accommodation in Sydney CBD. This Sydney accommodation is conveniently situated near Hyde Park, the Capitol Theatre, Darling Harbour and Sydney Tower with its Skywalk. It is a short walk to Oxford and Crown Streets, where guests can discover lots of activity and a broad range of restaurants, cafés and entertainment venues. This is where many of the city’s artists and musicians gather. Darling Harbour’s shopping along the waterfront and the Sydney Aquarium are just a few of the nearby attractions. Triple rooms are the best choice for small families. On-site car rental is available. Truly one of the best Sydney hotels for families, this high-rise hotel is just 1.5 km from the Sydney Harbour Bridge and 1.6 km from Darling Harbour. The 100% non-smoking modern rooms have flat-screen TVs and minibars, as well as tea and coffee-making facilities. Some rooms feature sitting rooms and kitchenettes with microwaves, while others have balconies. Room service is available and there is a restaurant and full bar on site. Laundry and fitness facilities cater to the busy family looking for value. 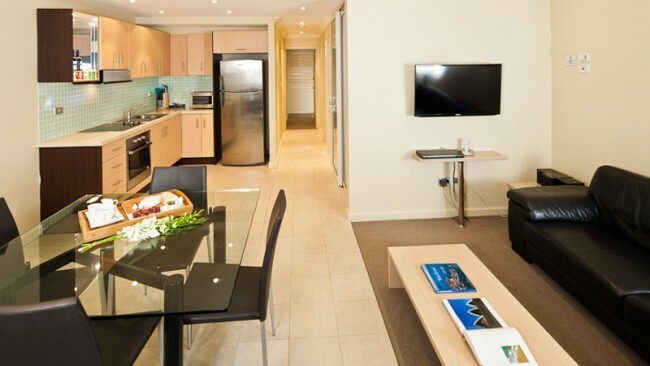 A great family hotel in Sydney is this seaside, 4.5 star luxury offering. 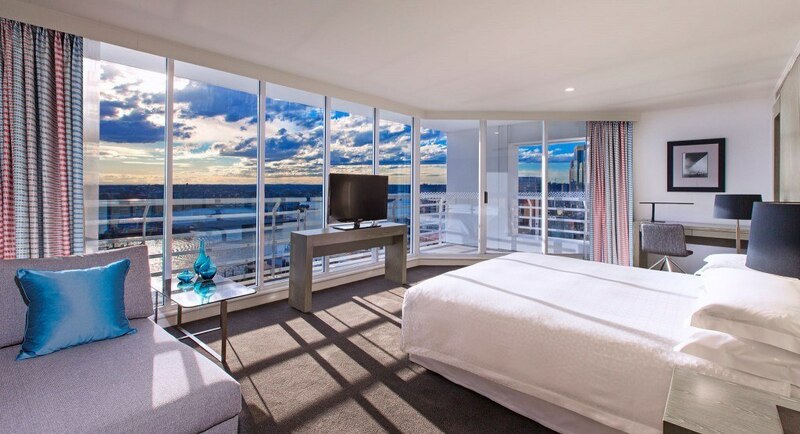 With 892 rooms and suites, this Sheraton overlooks the sparkling Darling Harbour. 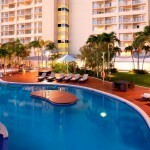 There are 3 dining options and a 24-hour fitness facility which cater to the guests of Australia’s largest hotel. Lavishly appointed rooms are designed for 2 to 3 persons. The Premium Maritime Suite features a wrap-around balcony, luxury bath and sitting area. Harbour or City View rooms all feature a safe, flat screen LCD TV and a spacious luxury bathroom. Best Part: Lavishly – appointed rooms. Top pick for Darling Harbour family accommodation. Waldorf Sydney Central Serviced Apartments – Located a 10-minute walk from Central Station, kitchen and laundry facilities in each studio and apartment. One of the best family hotels in Sydney for families on a budget. Manly Guest House – Located 6 minutes from the beach, this budget casual guest house has free WiFi and shared bathrooms. 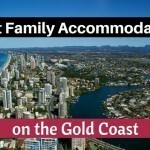 Kid friendly accommodation in Sydney for families on a budget. 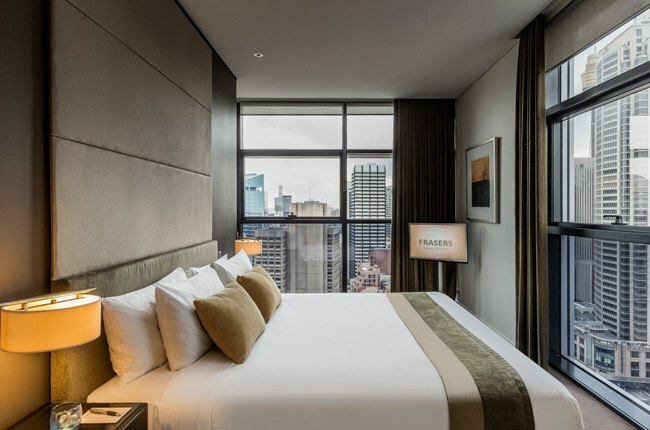 Vibe Hotel Sydney – Located near Hyde Park and Darling Harbour, trendy boutique hotel with quad family suites with 2 double beds or 1 double and 2 singles. Breakfree on Clarence – A good value choice for best family hotel in Sydney. Located very close to the Queen Victoria Market, offering rooms and quad suites. 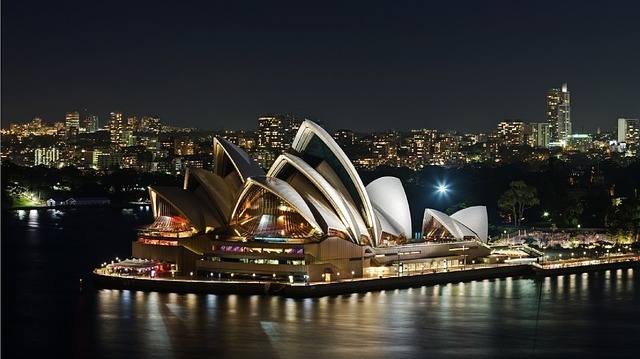 What is your favourite hotel in Sydney? Have you stayed in all those places? Hi Peter! Unfortunately not. They are compiled through a combination of experience, research and getting other family’s reviews. Hopefully, you find it useful. I am actually planning a family holiday to Sydney at the moment. I was actually looking at the ParkRoyal Darling Harbour in a suite. Any thoughts? We at a family of 4 with young children. Hi Savi! Yes for that many people, I would recommend looking at Airbnb. We use them a lot and have only had positive experiences by picking ones with great reviews. If you use this link, you will get a $45 off! 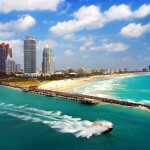 I love your blog and it definitely gives us a good starting-guide on some of our vacation. Currently, we are looking at ‘things to do in Sydney (with small kids)’, but I cannot seem to find in your blog. I did find Melbourne, Philip Island, and others, but couldn’t find Sydney. Can you please kindly direct me to the link? Hi Johan! Unfortunately, we are still yet to go to Sydney with kids but hubby is actually taking two of our kids tomorrow! There won’t be a full guide though unfortunately, as it’s just for the weekend. Hi Zainab! 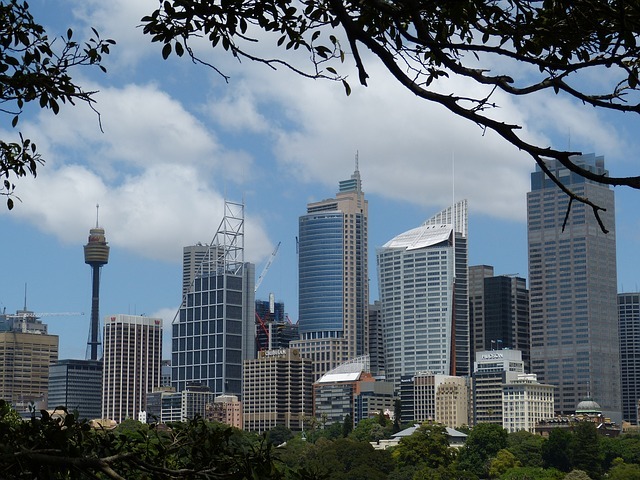 Currently we don’t have any articles about things to do in Sydney with kids on this blog although something will be published in the next week or two! I suggest liking us on Facebook and looking out for when we publicise the post on there. Love yr blog and details in prepping for the trip. We allocated a week for both places. How long shd I spend in each place? 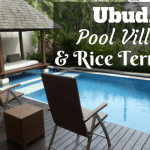 What would be ur best suggestion for 3 of us in the accommodation listed in ur blog? Would be good if u can shortlist the places given the time frame we have . Thanks in advance for yr time n recommendation. Hi Lily! One week is a good amount of time for Sydney. For Tasmania, don’t expect to go everywhere in one week. I would narrow it down to one or two areas.